There’s hardly an item more ubiquitous in the modern public building than toilet partitions. Or bathroom compartments. Or maybe you know them as restroom cubicles? The lay person often refers to them simply as “stalls” aren’t we all grateful for their existence? For those of us tasked with the design or maintenance of a commercial building there is a lot more to consider than just what to call these oh-so-important fixtures of modern society. Each material has its own advantages like economy, scratch resistance, durability, ease of installation and even resistance to mold and mildew. Partition support systems also vary from floor supported partitions to ceiling hung, floor-to-ceiling and even headrail braced floor-up systems. To find the right system for your building, call us at 801-299-0800. Our quotes are always free. 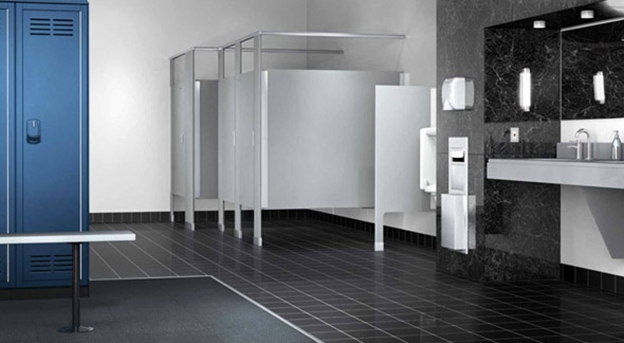 Let us put our experience with bathroom partitions to work for you! This entry was posted in Toilet Partitions on May 10, 2013 .